The bravest act a Plains Indian Warrior could achieve was to count coup on the enemy. Painted in his Medicine colors and his regalia, a warrior rode down and humiliated the enemy with the stick. The coup stick was rather plain, nevertheless it contained the warriors personal medicine when whack on the body of the opposing force. 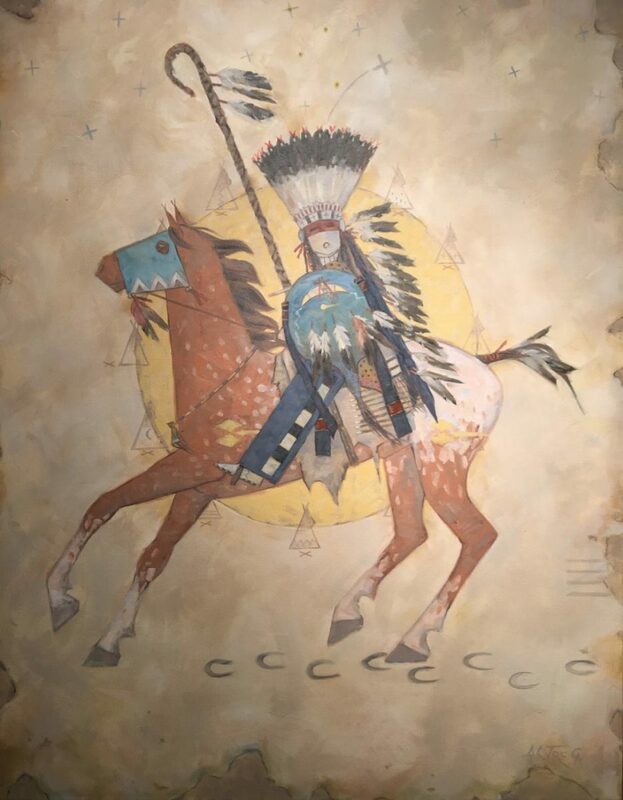 The painting depicts a Arapahoe warrior taunting the enemy. The warrior is wearing a full tail trailer of Eagle feathers. Dragonflies accompany his deed to counting coup.In the four corners are different colored small medicine bags and the indication of beadwork on sides of the hide. The sun represents the dust of many battles along the North Platte river.